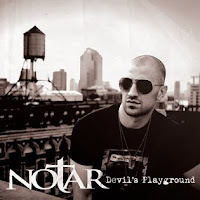 Tuesday, September 13 marks the day that rap/hip-hop artist Notar releases his debut album, Devil's Playground via Tyrannosaurus Records. Yes, that's the record labe l founded by the Counting Crows Adam Duritz who, doesn't look very hip-hoppy to me but hey, I probably don't look very rock 'n' roll either! Devil's Playground was produced by Notar, MGeezy and others. If you're into the hip-hop/rap thing, check it out. NOTAR’s debut album "Devil's Playground" drops September 13th on Tyrannosaurus Records (founded by Adam Duritz of Counting Crows). In many ways he defies the description of a typical hip-hop artist; Notar was raised as a classically trained trumpeter. But once he discovered hip-hop, there was no turning back, and this gritty, genre-defying performer was quickly on his way to the top. His music inhabits a space where the gutter meets the church choir, and harsh, raw beats settle nicely behind hook-driven rock melodies. This is no ordinary hip-hop sound, and NOTAR is no ordinary MC, with talents extending far beyond his genre. During the summer of 2010, Notar joined up with the Counting Crows' "The Traveling Circus and Medicine Show," performing for thousands of fans and dominating the stage with his unmatched energy, and organizer Adam Duritz told an interviewer, "I can't keep guys off the stage when he's playing. Everybody wants to play with him." "Devil's Playground" was produced by Notar himself, alongside famed hip-hop producer MGeezy (Paul Wall, Wyclef Jean, T-Pain) and others. The album consists of 13 tracks and features talent such as Young Cash, Chris Carraba of Dashboard Confessional and Adam Duritz.